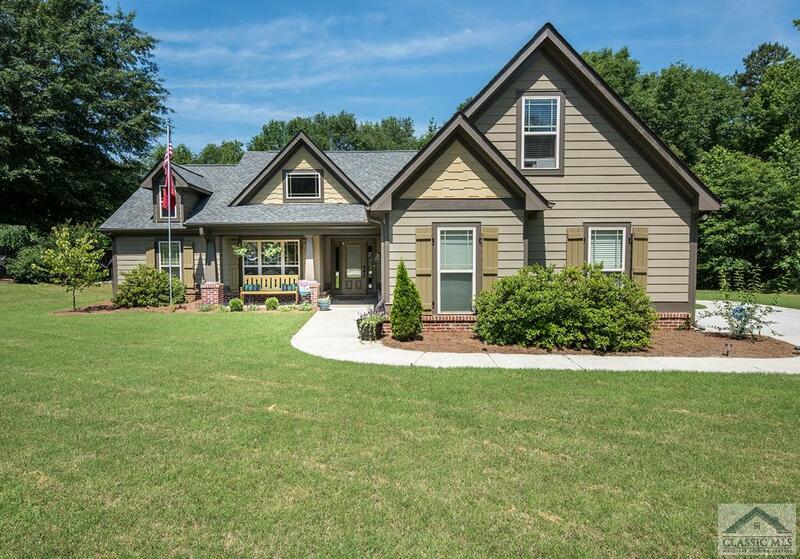 Gorgeous craftsman home in quiet, partially-developed subdivision. This home is a ranch-style split bedroom floor plan with master bedroom and two additional bedrooms on the main floor. You will love the openness of the floor plan which makes for a great entertaining home. Beautifully remodeled kitchen with quartz countertops! Vaulted great room with raised brick fireplace and beautiful painted wood mantle. Trey ceilings and crown molding in the master bedroom, garden-style tub and separate shower in the master bathroom, and daylight walk-in master closet completes the master bedroom suite. Separate Bonus room/4th bedroom/playroom makes for a great additional living space for kids or guests that come in town! Outdoor living at it's finest with a covered back porch, fire pit, built-in hammock and playground. River Glen is a subdivision within the city of Jefferson, Georgia. There are currently 2 Homes for Sale within River Glen, with asking prices ranging from $198,965 to $236,615. The average list price per square foot of the available inventory in River Glen is $101, which is below the Jefferson average of $163. The Average Sales price of all sold real estate in this subdivision for the past year is $211,125. Recent comparable homes have been selling for 97.26% of their asking price. Waterfront homes represent 0.00% of the available River Glen inventory. The population of Jefferson, according to the 2010 Census, is 9,432. The total number of households in the zip code of River Glen is 7,817, with an average household size for of 2.82 people. The total number of renter households within the zip code of 30549 is 1,592, which means that 79.63% of households in this zipcode are owner occupant households. 151 River Glen Drive, Jefferson GA 30549 is a Home, with 4 bedrooms which is recently sold, it has 1,996 sqft, .51-1 sized lot, and Attached,Garage,3+ Parking parking. A comparable Home, has 4 bedrooms and 2 baths, it was built in and is located at 160 River Glen Dr Jefferson GA 30549 and for sale by its owner at $ 198,965. This home is located in the city of Jefferson , in zip code 30549, this Jackson County Home, it is in the River Glen Subdivision, and Andrews Walk are nearby neighborhoods.